The Kittiwakes, a trio hailing from Essex, are another of the Midwich label’s understated and highly inventive acts. Lofoten Calling is an 11-track concept album about the people, landscape, wildlife and folklore of arctic Norway’s Lofoten Islands. Singer Kate Denny’s grandfather was involved in action there on the HMS Arethusa during World War II. Lofoten’s Viking heritage and fishing culture informs a lot of the music here. Its simplicity – often just piano, accordion and violin – allows little to detract from the message and melody. Weaver is the absolute standout – its plaintive refrain celebrating Denny’s lullaby-like vocal. The final track, The Arethusa, is a suitably emotional yet upbeat ending, conflating the islands’ isolation with the passion and longing of a sailor miles away from home. Lofoten Calling should be compulsory listening on every remote trawler battling on swelling tides. A concept-song-cycle inspired by Norway’s Lofoten Islands, characterised by atmospheric blending of trad British and Norwegian folk stylings and the striking vocal of its composer Kate Denny and her trio’s distinctive musical identity. Neck-prickling supporting harmonies weave into boldly spare instrumental textures (violin, accordion, piano, mando, guitar). Impressive and uniquely compelling. A wonderfully bright and highly original debut. The bleak but often awesome natural beauty of the region is evoked by Denny’s blend of traditional Norwegian and British styles. On first impressions, their hale and hearty delivery is certainly pleasing enough; but then so are most acts on the scene these days. From an instrumental viewpoint the music here has a warm lilt that would easily put a blush on the cheek of a many a céilidh-goer. However, one shouldn’t be lulled into getting all cosied-up. As what really gives the group their power and demands attention is their hair-raising collective voice. The best example of this is the title track, featuring goose-bump-inducing three-part harmonies – it’s an extraordinary sound. Much of the success of the album is down to its immediacy and directness. Unadorned by any studio trickery, when turned up loud (which is highly recommended) it’s almost like having the three Kittiwakes in the room with you. The in-your-face attitude in Denny’s singing combined with some haunting and poignant writing, as well their intricate but always robust playing, makes this a wonderfully bright and highly original debut. Some of the most stirring folk releases of the past year have come courtesy of Midwich Records, based in the sleepy Essex seaside town of Leigh-on-Sea . Albums by both Suffolk ‘s Nancy Wallace and Nottingham ‘s Ellen Mary McGee have found favour with both purists and hip young things alike. Now it’s time for local act The Kittiwakes to have their chance, and on the strength of this, they look set to make similar waves. Lofoten Calling, is that rarest of eggs, the folk concept album. Woven through eleven original songs by lead Kittiwake Kate Denny, the album tells tales of the people, places, flora and fauna of the windswept Lofoten Islands off the coast of Norway. Completed by Jill Cumberbatch and Chris Harrison, the trio provide all the music for the album. Despite being typically folk in timbre, the sounds are frequently orchestral in their richness, the twin violins of Denny and Cumberbatch summoning bracing arctic winds between them. Beautifully designed by Dom Cooper of labelmates The Straw Bear Band, Lofoten Calling is an inventive and thoroughly magical album. The Essex based trio The Kittiwakes have released their debut “Lofoten Calling”, a concept album with eleven self-crafted tracks from Kate Denny (vocals, fiddle) about the beauty of the Lofoten Islands in Arctic Norway. Two more excellent singers and musicians made the CD a creative masterwork of contemporary folk music: Jill Cumberbatch (fiddle, mandolin, banjo, guitar) and Chris Harrison (accordion, piano). Accordion and fiddles accompany the beautiful singing on “Maelstrom”, a perfect opener for a CD influenced by the folk tradition of the British Isles as well as Norway. Fine guitar playing is added to bring forward “Lynx”, a rhythmic folk song with wonderful singing and on the beautiful ballad “Weaver” piano and fiddle caress the hauntingly beautiful voice of Denny. The title song is a brilliant shanty with breathtaking a Capella singing and “Rowan, Birch and Cloudberry” an awesome instrumental waltz. My favourite song is “Midsummer, Midwinter”. Harrison’s tender piano and Denny’s soulful singing start with a gorgeous melody, the others join in and the sheer beauty is doubled with stunning fiddle and mandolin soli and the final choir. Hailing from Essex with striking songs and tunes The Kittiwakes create an exceptional scenery. One of the best new folk bands, hopefully they will come to festivals and gigs in continental Europe. Lofoten Calling is the brainchild of The Kittiwakes’ lead vocalist and violin player, Kate Denny, inspired by the landscapes, wildlife and traditions of the Lofoten Islands, an archipelago in the county of Nordland, Norway, that lies within the Arctic Circle. Lofoten Calling sets these inspirations in a melodious landscape that draws heavily on the traditional music of both Britain and Norway, though the music and lyrics are all original. There is something enticingly eccentric about the music and performance here, that is sure to set this recording apart from anything else you will hear. The arrangements are refreshingly honest and unfussy, remaining true to the actual sound of the instruments, resulting in a delightfully uncluttered listening experience. The sounds of maritime traditions chime proudly throughout Lofoten Calling , largely thanks to the fluid and illuminating accordion of Chris Harrison, adding much depth with its bass notes, whilst accommodating the more nimble melodies with great aplomb. The vocal arrangements are nothing short of inspired, with robust and alluring harmonies. Kate Denny’s precise and penetrating vocals are delightfully animated, flooding her stories with whimsical character, whilst the more resonant tones of Jill Cumberbatch provide the perfect foil, and more than the occasional nod towards the illustrious Maddy Prior. Various string instruments are plucked and bowed with great elegance and purpose, and an occasional piano brings a refined touch. By bringing together the folklore and natural history with the personal lives of the Lofotens’ past and present, Kate Denny has crafted a collection of lyrics that offers a bewitching insight into this unique landscape. The islands’ maritime and fishing industries feature heavily, where songs pay tribute to the work ethic and the inevitable love and loss that accompanies such enterprise. The unique natural characteristics of the area are represented by songs about the maelstrom, the long days of midsummer, and the long nights of midwinter, whilst “Lynx” offers a fanciful folkloric take on how nature conspired to create the Lofoten Islands. Lofoten Calling is a unique endeavour that rewards with both fine musicality and the rich imagery that is woven by Kate Denny’s inspired lyrics, that should rightfully win a place amongst the best folk releases of 2009. A while ago I enthused about Kate Waterfield’s astonishing Runa Megin album, a true masterpiece exploring the Nordic runes. Since then, Kate (now known as Kate Denny) has formed The Kittiwakes, whose debut album Lofoten Calling continues to demonstrate Kate’s passion for Scandinavian culture. Firmly immersed in the traditional music of Britain and Norway, the material here sounds authentically traditional in terms of the music and lyrics, and the arrangements which are based around instruments such as violin, mandolin and accordion. The music is superbly crafted and easily in the same league as any of the big name folk artists. Weaver is a reflective, introspective song set in the Viking age, told from the perspective of a weaver of ship sails, holding on to all hope that her beloved will return safely from sea. Hurtigruten is an ode to the Norwegian passenger liner, part sea shanty and part Regency-era country dance. Lofoten Calling is an a cappella piece in which beautiful vocal harmonies are provided by all the band members. The plaintive love song Sailor Song is followed by the carefree tale of legendary shepherd Ole Petter , set to a lively waltz rhythm. Rowan, Birch and Cloudberry is a very fine instrumental that merges a 19th century style country dance tune with touches of baroque and mournful folk. Fisherman is a beautiful ballad that sounds in every way like an authentic traditional piece. The Arethusa is inspired by the ship Kate’s grandfather served on during World War II, which was involved in action at the Lofoten Islands. The upbeat waltz rhythm masks bleak lyrical sentiments of icy cold weather conditions and a longing to return home from war. As I share The Kittiwakes’ fascination with old-school folk music and Scandinavian history and folklore, I can really identify with the music here. This is by far the most exciting album I’ve heard in a while and I will certainly be keeping a look out for any future offerings from this band. Review of Album Launch 22nd June 2009 for Folk and Roots Online. 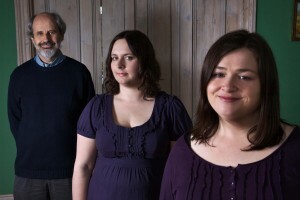 The Kittiwakes are an Essex based trio, composed of Kate Denny (fiddle, vocals), Chris Harrison (accordion, guitar, vocals), and Jill Cumberbatch (anything with strings, vocals) and the trio perform self composed tunes and songs influenced by the traditional music of the British Isles and Norway. I first had the good fortune to become of their existence a few short years ago when someone pointed me in the direction of their free downloads that were briefly available from ill-fated folk download site Woven Wheat Whispers, since then I’ve made the effort to catch them live when possible, the first occasion being their set at the 2008 Leigh Folk Festival, when they played the open air stage when they had to contend with a rail track immediately to their rear and the wind to their fore, all of which added a little atmosphere to their tunes and songs based on the landscape and folklore of the Lofoten Islands (more of this below), that said it was a bit of a relief when they were allocated a slot in the considerably more tranquil Clarendon Scouts Hut for the 2009 Festival, barely a train to be heard. However to the point the trio launched their first release on June 22nd 2009 and made the good choice of venue in the Electroacoustic club in Clerkenwell, London more a large basement living room with friendly atmosphere combined with good acoustics and respectful audience, than your usual pub venue. The evening commenced with an impressive choice of support artist, new to folk and roots, Lucy Farrell ( myspace.com/lucyfarrell ), Farrell is one of the latest graduates of the Newcastle Folk Music degree, and for this evening she was accompanied by brother Jake on electric guitar and herself on fiddle (usually plucked). Farrell delivered one of the most impressive support slots I’ve experienced for a long time, covering songs including Lal Waterson’s ‘The Birds’ and Anne Brigg’s version of the ‘The Cuckoo’. After a short break, The Kittiwakes took to the Stage at shortly after nine opening with covering all eleven songs and instrumentals featured on the album, one of many benefits of seeing The Kittiwakes live is that Denny, the composer/songwriter who gained her inspiration from the Lofoten Islands, Northern Norway explains the inspiration of the compositions creating a context for the song that follows, not to say the music doesn’t stand alone in its own right, but the context helps to understand both the songs and the mood, tempo of the tunes..
As the trio started the evening they took the audience on a hours journey through the stories and folklore of the Lofotens, this theme started early in the sets proceedings with ‘Maelstrom’ a song inspired by the tidal currents around the Lofotens, followed by a change of mood with the Hurtigruten, an upbeat tune that featured for the first time during the set Denny’s and Cumberbatch’s duel on fiddles, ‘Hurtigruten’ being dedicated to the actual Hurtigruten line, the Norwegian passenger liners serving the islands – hence the vocal harmony refrain. This being followed by a change of mood with ‘The Sailor Song’, sang from the perspective of the woman whose partner has left her for a life on the seas. ‘The Lynx’ then returned us to the local folklore, concerning the shape of the island according to which was formed by a imprint of a Lynx paw, from here again the mood changed with the song ‘The Weavers’, telling the tales of the Women who made the sails for their menfolk of old (i.e the Vikings) as they departed their villages for the waves. For the compulsory and extremely welcome encore the trio returned with the title track of the release namely ‘Lofoten Calling’, with the trio singing acapella mixing harmonies and Cumberbatch and Denny switching lead parts, needless to say ‘Lofoten Calling’ paints a picture of the scenery during a journey to the Islands themselves. The Kittiwakes provided the audience with both an outstanding set of songs and tunes, whilst at the same evocative, with a special mention of Denny’s song writing skills, the characters and scenery she describes are given life in a sensitive and descriptive manner where required, with wonderful contrast between harmonising (on both fiddle and vocal, tunes and stories, a Kittiwakes concert is almost an mini-education in itself (I was certainly tempted to go home and spend some time with google to discover more of the background to the stories Denny provides so well).